I did not enjoy work at all today. It was between 29 and 33°C all day (roughly between 84 – 91.5 °F if you prefer) and we have no air conditioning. Also, I work upstairs and you could literally feel the air getting hotter with every step you walked up. I was aware that heat rises but unti, I started working here had no idea of the extremes. Also, I ended up working on a financial translation pretty much all day, which is not exactly my favourite type of text at the best of times. And on top of that, a customer had complained about one of my translations while I was off, so I had a lovely e-mail to come back to as well. Cue hot, bored and grumpy Bev. Ugh. But enough about that. I am now going to cheer myself up by reliving my sister’s visit, starting with day one. So my sister and her boyfriend arrived on Wednesday evening. I went to pick them up from the airport straight after work, then we went to get a train home… which turned out to be 50 minutes delayed. So much for German efficiency… We did, however, arrive home eventually where we immediately opened a few bottles of beer and set about making our evening meal: Chicken enchiladas. Or it may have been turkey. Some kind of bird. Either way, they were delicious. The next morning (the first of my days off), we were up bright and early for breakfast before heading off to Heidelberg. I’ve been there many times before, but it’s pretty, it has an English shop, which I never have any objections to checking out, and it was one of the places my sister wanted to see, so off we went. It is incredibly – and I mean incredibly – touristy, to the extent that they actually sell T-shirts with the slogan “I’m not a tourist – I live here”. 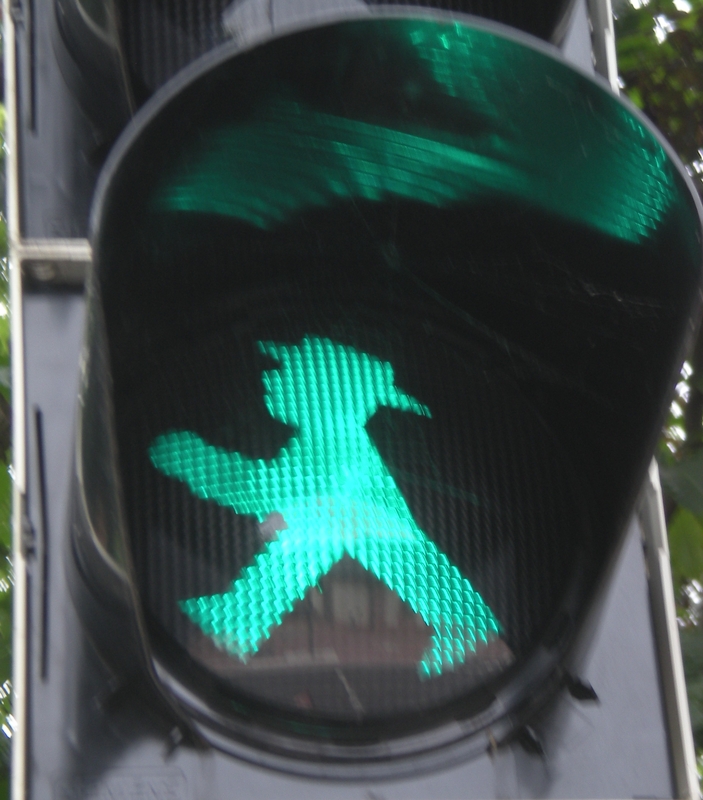 Also, on the way up we spotted an East-German style Ampelmann, which I got slighted excited about. Then we took the long walk back down into town and rewarded ourselves with a nice cold beer before taking the train back to Karlsruhe. The evening was spent meeting friends and eating delicious food at Marktlücke in Karlsruhe, until we were asked to leave because it was 1 a .m. and, it being a week night, they wanted to close. … and that was day one of our adventures. For the rest, you will have to wait.